Microsoft has quietly released the full, original disk images (ISOs) for build 15063 of Windows 10 version 1703—the Creators Update, codename Redstone 2—and yesterday Windows fan Steve Truman, @KPRP42, published a list of links to Microsoft’s Techbench download servers. I recommend that you do not install these ISOs. In fact, over the course of the week I will describe how to avoid the Creators Update, at least until it’s ready for prime time. No matter how you slice it, Creators Update isn’t ready for any PC that you rely on. That said, if you have a sacrificial machine and don’t want to join the 10 million Windows Insiders in their unpaid beta testing, you can see a description of the downloads along with their links in Andy Weir’s Neowin article from last night. Build 15063 will roll out to those in the Windows Insider Preview ring. I expect to see a Release Preview announcement any day. The ISO files will be posted on the MSDN site for paying customers to download. At about the same time we’ll get some sort of official acknowledgment that this is the “real” Creators Update, along with general availability of the ISOs. It’ll be interesting to see how Microsoft words the announcement, having spent more than a week dodging questions as to whether build 15063 is in fact RTM. Much more is yet to come. While the Windows lemmings rush to install the latest, developers at Microsoft still have their heads down, building a big first-time patch—or series of patches—for Creators Update. 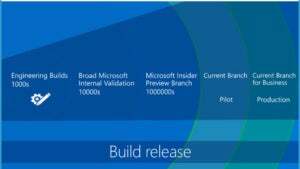 When version 1703 hits, it will likely incorporate build 15063 and some aggregation of patches. Look for build 15063.x, where x is greater than 1. Those who already have 15063 installed—from the Insider Program or by downloading and installing the ISOs—will have to apply outstanding cumulative updates in order to get their systems brought up to speed. We saw this happen with the Anniversary Update. The base build 14393, released on July 19, was bumped up to 14393.3 the week before release on July 25, then 14393.10 finally emerged as the “real” released version at general availability, on Aug. 2. You may also recall that 14393.10 brought with it an astounding number of drop-dead bugs, which I wrote about on Aug. 4, Sept. 13, Sept. 15, Sept. 30, and even as late as Oct. 13—more than two months after the original release. That’s in addition to the minor bugs and self-inflicted bugs introduced by interim fixes and patches. This is the way it’s always been. There were even more bugs with the Fall (renamed November) Update, build 10586—I counted nine cumulative updates in the first three weeks. Microsoft has conveniently pulled the list of released build numbers for version 1511. It’s still hard to believe, but this behavior—a massive numbers of bugs seen in the first few months after release—is by design; it’s part of Windows as a Service. This cannon-fodder phase, officially designated “Pilot” in this slide from a presentation by Microsoft Product Manager Nic Fillingham, spans the time from general availability until the version is anointed with the Current Branch for Business designation. That typically takes four months, during which time those who install the latest version of Windows 10 are, by hook or by crook, part of the pilot program. The reference to “20170411” strongly suggests the Creators Update will be released on April 11. That’s also Patch Tuesday, so we’re gonna be busy. According to advertising network AdDuplex, 60 days after the Aug. 2, 2016, introduction of Windows 10 1607—aka Anniversary Update—just 35% of measured Windows 10 PCs were running the upgrade. By the 90-day mark, however, that number had soared to 80%, showing that Microsoft, after a purposefully slow start, had stomped on the update accelerator. I think of it as a remotely controlled extended beta test, where the paying testers generally have no idea they’re running on a rat wheel. For now, you don’t need to do anything except watch and wait. And tell your friends.